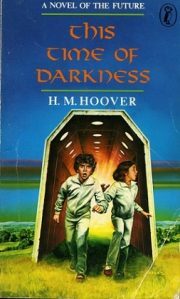 H. M. Hoover is the author of at least thirteen novels to my knowledge, all published between 1977 and 1995. Her 1995 novel The Winds of Mars won the (unfortunately named but still prestigious) Golden Duck. She is, therefore, someone of whom I am aware . 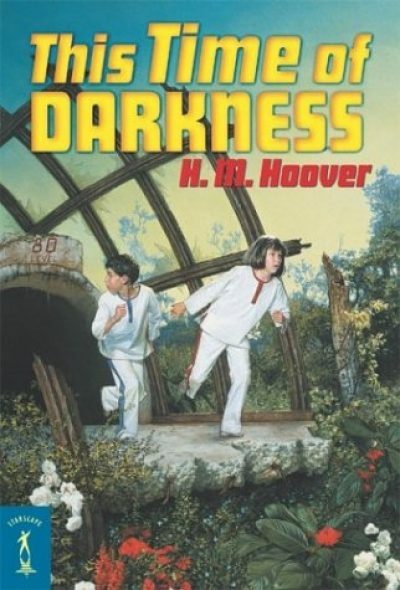 So it is inexplicable, really, that 1980’s This Time of Darkness is the first novel of Hoover’s that I have actually read . No, not when it first came out—only a couple of days ago. The timing is a bit unfortunate; I think readers in the target age range will still like it, although my personal reaction was coloured by the way Hoover used urban decay tropes of which I am very very tired. In these times, no phrases have such synergy as “young adult novel” and “hellish, Orwellian urban dystopia.” Eleven-year-old Amy would tell you all about dystopias if the allowed vocabulary for the lower levels included terms like “Orwellian” or “dystopia”. Already a pariah thanks to her suspicious literacy, she compounds her crimes by befriending young Axel, a visibly disturbed boy with an outrageous tale: he claims to come from outside the City, from outside the decaying realm that is, as far as anyone in it knows, the whole of the world. Amy’s part of the city is filthy, run-down, and infested with vermin. People living there stay there mainly because they have been told from childhood that the city is vast but homogeneous; there are no better neighborhoods to which they might move. Adding to the unpleasantness is the sad fact that people of Amy’s social class eschew loving relationships. They are instead encouraged to focus on work and consumption; Amy’s mother had to be bribed to have a child at all and is openly waiting for the day when her daughter will move out and take the aura of social deviancy with her. With no reason to stay—beyond the fear that if she is caught outside her designated neighborhood, she will be detained and brainwashed into submission—Amy decides to accompany poor Axel, who is slowly being driven mad by the horrors of life in the city, on a desperate quest to find the mythical 80th floor and just perhaps, the way out of the city. Hours of searching turn into days but while the city does seem to be endless, it soon becomes clear that the authorities lied when they claimed the city was uniform. Once that lie is exposed, Axel’s claim that there is an Outside seems more credible. Between the children and Axel’s lost home, however, lie dozens of levels and layers of defenses designed to prevent such escapes. Defenses, some of which are lethal. 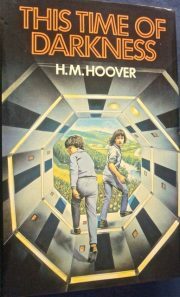 Hoover’s unpleasant urban landscape is a fairly standard riff on cities circa 1980, an reduction ad absurdum of 1970s urban woes. Her novel is a nice example of that particular strain of science fiction that thinks humanity made a terrible mistake when it decided to build three huts in a group. That said, this particular world is terrible not so much because cities are themselves terrible—there are some nice neighborhoods in this one —but because the people running the city have decided keeping the rabble in line is more important than anything else. Educating the rabble well enough that they can maintain the infrastructure is apparently seen as a security risk. What we see is a world after a long period of decline, a community doomed because its elite is more terrified of the masses than it is of the slow, ongoing, familiar collapse. The story itself is of a familiar form, typical of the juvenile dystopias of the 1970s. An adult dystopia might involve a situation where escape is meaningless. If Winston Smith had rowed across the channel to Eurasia, it seems reasonable that he might have found himself living under exactly the same sort of regime he had just fled. Juvenile dystopias of this period, like Sleep Two Three Four or The Butterfly Revolution, usually feature a terrible situation that’s geographically bounded and therefore escapable. Amy and Axel really can hope to find somewhere less terrible than her home. Rather unusually for its era, Hoover makes Amy the active member of the partnership. Axel may be the one who knows about the Outside, but it’s Amy who is the motive force for the expedition, the one who thinks to pack supplies, the one who doesn’t go catatonic whenever stress levels get too high. Axel in contrast has some useful knowledge and connections (once they are Outside, anyway) but is clearly the less useful person on the team. 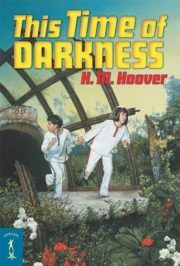 This book isn’t as dark and hopeless as, say, Sleator’s House of Stairs, but Hoover’s wretched hive of ignorance and exploitation is pretty dark. I am a bit surprised that This Time of Darkness’s boat didn’t rise on the present-day tide of young adult dystopias. I think there are two factors working against This Time of Darkness here. The lesser of the two is that, as I said, this is written in the style of Disco-era juvenile dystopia; modern readers may find it a little quaint (and I got my personal fill of SF about dreadful cities decades ago). The factor that matters is timing; by reprinting this in 2003, rather than five years later, Starscape was just a bit too early to take advantage of recent changes in public taste. This Time of Darkness is out of print as far as I can tell. ABE Books, Bookfinder, and your local library are your friends in this matter. Your younger relatives may thank you for finding it for them. 1: Although I don’t think I heard of her in the 1970s, when I would have been most likely to pick up one of her books. I think it was the husband of my then-gf who first mentioned Hoover to me and that was much later than the 1970s. 2: I thought I might have read something of hers in 2003, because I knew she was part of the Starscape giveaway at TorCon. Nope, I was thinking of Lubar’s Hidden Talents. 3: And it’s not as if the wild crazies make a great case for living in a state of nature.